Making a Summer Relocation to London Without Olympics Tickets? If your relocation to London coincides with the London 2012 Olympic games, don’t be dismayed if you don’t have tickets to any events. There will still be loads of ways to enjoy this momentous occasion (spanning from July 27th to August 12th), and if you’re actually making a relocation versus just visiting, you’ll have the advantage of having a real home base here from which to experience the events. The official 2012 Olympics website (www.london2012.com) is the ultimate resource for any event or ticket information you seek, and certainly the most legitimate. Now that the local UK and EU lotteries have long passed—an early opportunity you perhaps participated in if you’ve already made your relocation—tickets are available to the general public on a first-come, first-served basis. There should be additional tickets released nearly every day right up until the Olympic Games, especially since existing ticketholders are now eligible to put theirs up for resale at face value if they so desire. And I can only imagine there will be scalpers present at venues day-of. If purchasing tickets outside the official 2012 organization, however, be very, very scrutinizing of the credibility of third-party vendors; there are likely many Olympic ticket scams out there. Getting duped out of a good amount of your first British pounds wouldn’t be the most pleasant way to kick off a relocation! Even if you don’t buy tickets, your relocation obviously situates you in a prime location to still experience the Olympics. The Olympic torch has been carried throughout Britain for several weeks now, and local parties have emerged on the streets to cheer the torchbearers on. You can join in on the festivities, too, if you keep posted on the torch’s whereabouts (see london2012.com/torch-relay)—it’ll be entering the city soon and might even end up going right through the neighborhood where you make your relocation! Also free to spectators on the city streets are the marathon and road cycling events. Each of these races begin and end on the Mall in front of Buckingham Palace, so scout out a spot there or anywhere along the race routes early enough to get a good vantage. And as I mentioned in my recent Olympics post, there will also be giant screens set up in Hyde Park, Victoria Park, and Trafalgar Square, where crowds can meet and picnic to watch the events as well as enjoy live entertainment—all for free and all enabling you to truly embrace the spirit of a relocation. You can also visit the sites of Olympics events after your relocation. Many are closed off already as they prepare to get their Games on, but you can stroll through the Olympic village and see the Olympic Stadium where the opening and closing ceremonies will be held along with athletic events. Even better, you can ride London’s newly installed cable car from Greenwich to Olympic Park (see www.tfl.gov.uk/modalpages/23828.aspx). Especially advantageous to those making a relocation (and who can therefore stick around in the UK awhile) is that you can even participate inside an authentic venue after the Games are over—12 miles north of Olympic Park is the Lee Valley White Water Center, which will reopen to the public so the brave among us can kayak through the rapids. It’s practically mandatory for you to get your fix of the Olympics if you’re making a relocation in time for them, but I acknowledge that you might also want a diversion from the athletics as you get acquainted with your new home. Fortunately, because London anticipates a slew of tourists for the Olympics, its tourism officials have also coordinated a variety of free arts events to take advantage of. The 2012 Festival is the Games’ official cultural counterpart and consists of music, theatre, and carnivals. 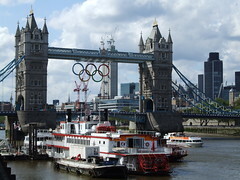 A big highlight is coming up next weekend on July 21st to 22nd: if you’ve already made your relocation to London, check out the “River of Music,” which will be held at assorted iconic London sites along the River Thames and will include musical performances representing each of the 205 participating Olympic nations. A relocation is ridiculously fun and exciting with gobs of events and sites to see anyway, and moving here in time for the Olympics only amplifies that! It’s an incredible time to live in this cultural capital, so seize every day as an opportunity to experience something new. If the Olympics crowds have you nervous, though, don’t hesitate to ask our London Relocation agents for advice on transport and London neighborhoods to avoid. However you approach the summer here, make it a relocation to remember!